Alternatively, please contact our practice leaders directly. Registered office: 10 Wellington Street, Cambridge, CB1 1HW, United Kingdom. Our first office was in the Economist Building, home of the world famous publication. Although we are not fans of modernist architecture, this 1964 building is worthy of note being one of the first examples of '60s architecture to achieve listed status. 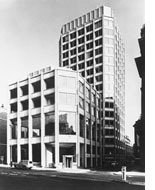 The Smithsons' Economist Building in St James's is an icon of English Modernism. We, and The Economist, occupy a tower with exceptional views over London, set back on the corner of Bury Street and Ryder Street. Entrance is via a smaller pavilion-like structure flanking Boodles Club on St James's Street.